What is Marijuana Being Blamed for Now? Marijuana has been steadily increasing in popularity in the USA since it was first legalized medically in 1996. But despite its continuing success, it is still being blamed. But what for this time? Marijuana has been steadily inclining in popularity in the USA since it was first legalized medically in California in 1996, and despite its continuing medical and economical success, it is still being blamed. But what for this time? The marijuana industry has continued to receive attack after attack, in spite of the fact that it has been a raging success for the medical industry and for the economy. Now it is being reported that marijuana is taking up all the space on the electricity grid and could be causing environmental problems. On an online publication recently, Quartz magazine brought to light the increasing cost of electricity to run indoor marijuana grow operations. Most marijuana growhouses are being operated indoors in order to maintain very controlled climate and growing environments. Naturally, this requires the use of LED lights, and in grow houses that are quire large, this chews through a lot of the electricity on the grid. In the Columbia Journal of Environmental Law, it was published that the marijuana industry in the USA is using about 1% of all of the electricity that is available in the country, and $6 billion worth of electricity each year. Well, most people might think that the electricity companies would be excited at the opportunity to make a lot more money from an industry that is continuing to grow. 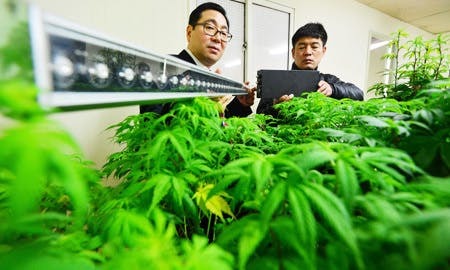 However, it seems to be quite the opposite, with the marijuana industry having thrown a spanner in the works of the US trying to manage their electricity usage. Should the marijuana industry try to adapt? So this accusation begs the question as to whether or not the marijuana industry should comply, and adapt their growing methods be more environmentally sustainable. Well, there is no clear answer to this question. There are a lot of industries in the USA that are chewing through power on the grid, and industries that perhaps don’t offer as much to the American public as the marijuana industry. The marijuana cannot continue to ignore the problem that indoor growing operations could be having on the environment. Demand in high in the USA at the moment, and supply has to be there to be able to keep up with the demand. In order to do this, growing operations are being led indoors so as to yield all year around. However, to chew through the resources of the environment to grow a plant that grows naturally outside poses a real sustainability issue. It is important that leaders in the marijuana industry at the very least consider the amount of power that is being used at these indoor growing operations. Earlier this year, marijuana growing operations were the reason for seven power outages in Portland. The evidence suggests that marijuana industries are using more electricity than what has been accounted for in the past, and both the marijuana and electricity industries are being forced to keep up with this. The legalization movement continues to encounter hurdles and this one is no exception. The 2016 ballot is going to see the vote for legal marijuana in many states and it won’t be long until recreational marijuana is available in most of America. It is important that the marijuana industry finds a solution to this problem before it becomes a major environmental issue. Although the marijuana industry is using a lot of electricity, it should not be ostracized as an industry because of this. Nonetheless, the marijuana industry should be trying to be environmentally conscious, because that is exactly what marijuana is!